I remember my very first backpacking trip like it was yesterday. It wasn’t, of course. It was some 25+ years ago, but it’s cemented in my mind like it was yesterday. Not knowing any better and wanting to be as prepared as possible, I packed gear for most any occasion. I packed a change of clothes for each day. I packed an extra set of boots in case my primary footwear got wet and wasn’t warm enough for the December cold. I packed an insulated set of coveralls. And the list goes on and on. I was prepared. But I wasn’t prepared for the weight of it all. At the time, I weighed 150 lbs or so. My pack weighed 62 lbs, nearly 1/2 of my body weight. For those who don’t backpack regularly, your pack should weigh no more than 1/4 to 1/3 of your body weight. My pack was way to heavy and the trip wasn’t nearly as enjoyable as it could have been. Despite my aching shoulders and hips, I had a lot of fun on that trip and it was the start of a lifelong passion. I’ve enjoyed backpacking ever since. I’ve learned a lot since that first trip. I’ve learned that I can get by with much less than I thought I’d need. I don’t need an extra set of footwear. Take one good pair of boots or hiking shoes and take care of them. If they get wet, you can dry them out. I don’t take one set of coveralls to keep warm; I’ll get too hot in them while hiking. Remember the 3 W’s of dressing for cold weather. Dress in layers. These days, my pack weighs between 28 and 35 pounds depending on how much food and water I carry with me. The trips are far more enjoyable, too. My shoulders and hips are in good shape throughout the trip. And these lessons can be applied to your Bug-Out-Bag or your Get-Home-Bag as well. While doing research, I’ve read a lot of mini-books or articles about creating the perfect emergency bag. Despite claims to the opposite, most have tried to be very comprehensive and include most anything you could ever need during your trip. And that’s not entirely bad. You don’t want to discover that you are missing a critical piece of equipment in a time of need. 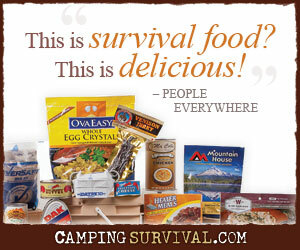 But I’m concerned that sometimes we, as preppers, may read these lists and think that our bags fall short, that they are somehow inadequate because we didn’t include some piece of equipment that the author advocated. However, remember that it’s up to us, as individual preppers, to be responsible for our own gear and planning. Read and research. Learn from others. But in the end make up your own mind about what gear you should pack in your bags, and which you can do without. A bag that too heavy or bulky is more apt to get left behind. You won’t toss it in your vehicle before going to work or on a trip. You won’t carry it with you on the day hike. It’s bulk and heft will become a mental obstacle for you. I’d much rather have a lighter and smaller bag that contains my essentials, I can easily toss it on my back and set out on a day hike. If that accidentally turns into a multi-day adventure, I’ll have what I need. It’s easy to move from vehicle to vehicle as needed. It’s easy to carry with me wherever I go. A lighter bag will, however, often require more skills and knowledge to supplement. Fortunately that’s very lightweight. For example, rather than carrying 5 ways to start a fire, perhaps you only carry one or two. But you’ll have to be more skilled at building a fire. One last word of advice. Take this advice with the same caution as you do the others. It’s not right for everyone. If you are just starting out with prepping and you feel you still have a lot to learn before you feel comfortable carrying less, by all means it may be better for you to have a heavier and bulkier bag. My guess is this was the 3 day camping trip up Mt. Cheaha when the temps dropped into the teens. Glad you can remember how much you enjoyed it rather than how cold and tired you were. “your pack should weigh no more than 1/4 to 1/3 of your body weight.” – Joe, Good information to share. Thanks!